We are collecting data to provide evidence for groundwater beneath the surface of Mars. Liquid water would mean that conditions on Mars were potentially once conducive to life. Recent developments have shown there is water on Mars, whether at the planet’s poles or below the surface. Further evidence could constrain where and in what amount groundwater exists on Mars, and would be a significant breakthrough for planetary science. By using geographic features we can search for groundwater from space. Maars are craters formed from volcanic explosions which occur when groundwater comes into contact with lava or magma. 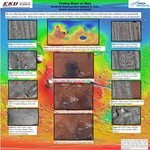 Maars on Mars would provide evidence for water in the past. We use JMars to display satellite data on which we trace depressions, and record the marked locations. In Xanthe Terra, we mapped depressions ≥ 1 km in diameter within 1° squares. We mapped depressions caused by craters, collapsed ice features, smaller secondary craters associated with larger craters, or even volcanoes – particularly maars. Our current focus is on the Arena Colles region. Our criteria for this region includes mapping surface features ≥ 0.25 km in assigned 1° squares. The initial results from our research show many craters in the Xanthe Terra region on Mars, some of which may indicate volcanic activity in the past. 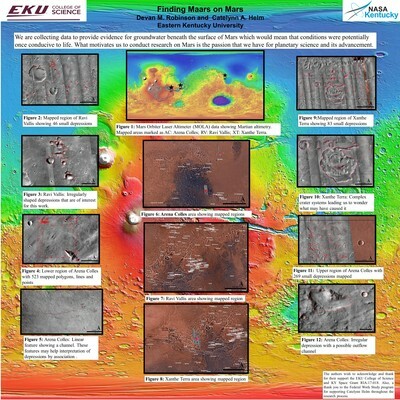 This will provide us with a reasonable possibility that we may find maars, which would greatly progress our search for groundwater at or below the surface of Mars.